The Miss Turkey 2018 pageant concluded on September 24 with the election of the country’s representatives to three of the Big5 major beauty competitions. Şevval Şahin, a 19-year-old model and fashion marketing student studying at the University of East London, was crowned Miss Turkey World 2018. She will represent the country at the 2018 Miss World finals in December in Sanya, China. Tara Madelein De Vries bagged the Miss Turkey Universe 2018 title. 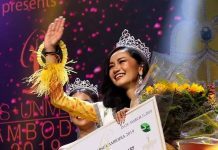 The 19-year-old business administration student will compete at the 2018 Miss Universe competition to be held in Bangkok, Thailand in December. The Miss Turkey Supranational 2018 title went to Roda Irmak Kalkan. The 18-year-old political science and economics major will travel to Krynica-Zdrój for the 2018 Miss Supranational finals in December.